Left to right: Lauren Skelly, Audrey Hicks, Hilary Caldwell, Maureen MacDonald. Four individuals from McMaster’s department of Kinesiology were recognized at the annual meeting of the Canadian Society for Exercise Physiology (CSEP), held in Niagara Falls from October 31 to November 2. Maureen MacDonald, dean of the Faculty of Science, received the Mentorship Award for her dedication and mentorship to students and faculty members. And PhD candidate Hilary Caldwell was a finalist for the Graduate Student Award – Oral Competition. Caldwell works with the Child Health and Exercise Medicine Program. CSEP is a voluntary organization composed of professionals interested and involved in the scientific study of exercise physiology, exercise biochemistry, fitness and health. It was founded at the Pan American Games, Winnipeg, Manitoba in 1967 – the result of four years of cooperative efforts by the Canadian Medical Association and the Canadian Association for Health, Physical Education, Recreation and Dance. 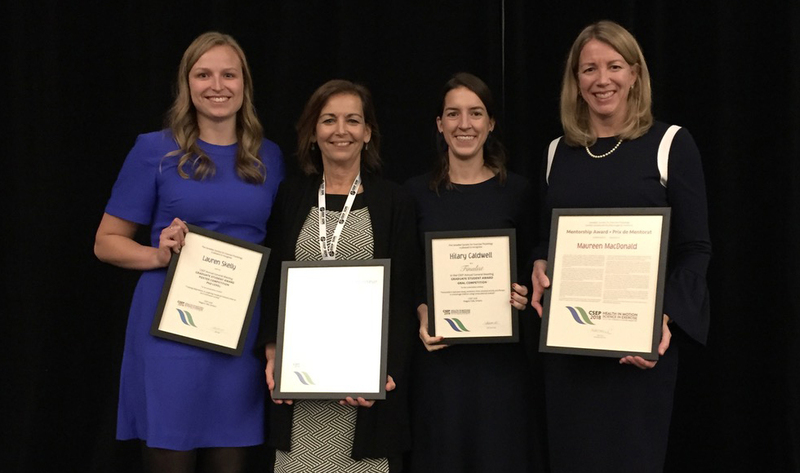 Four individuals from McMaster's department of Kinesiology were recognized at the annual meeting of the Canadian Society for Exercise Physiology (<a href="http://www.csep.ca/en/about-csep/awards--grants-/csep-awards">CSEP</a>), held in Niagara Falls from October 31 to November 2. Maureen MacDonald, dean of the Faculty of Science, received the Mentorship Award for her dedication and mentorship to students and faculty members. Audrey Hicks, professor and Associate Chair Undergraduate Program, received the Honour Award, CSEP's highest recognition. The award recognizes an individual who has made an outstanding contribution to exercise physiology in Canada. She is the first female recipient in the history of the Society. Hicks was also named one of eight individuals recognized with inaugural Fellowship in the Society. PhD candidate Lauren Skelly won the Graduate Student Award - Poster Competition. Her research examined the role of exercise intensity and contraction pattern on skeletal muscle adaptations to training. And PhD candidate Hilary Caldwell was a finalist for the Graduate Student Award - Oral Competition. Caldwell works with the Child Health and Exercise Medicine Program. <a href="http://www.csep.ca/en/about-csep/about-the-canadian-society-for-exercise-physiology">CSEP</a> is a voluntary organization composed of professionals interested and involved in the scientific study of exercise physiology, exercise biochemistry, fitness and health. It was founded at the Pan American Games, Winnipeg, Manitoba in 1967 - the result of four years of cooperative efforts by the Canadian Medical Association and the Canadian Association for Health, Physical Education, Recreation and Dance.